Hull FC have agreed a deal to sign Salford City Reds half-back Daniel Holdsworth for next season. 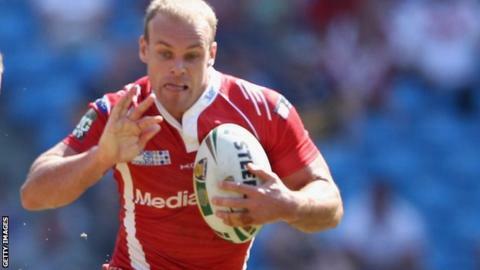 The 28-year-old Australian has signed a two-year deal with Peter Gentle's side after three years with Salford. "An opportunity came up to secure his services and I jumped at it," coach Gentle told BBC Radio Manchester. "He gives us another string to our bow in our attack, defensively he's solid and also brings a kicking game to us. We're sadly lacking in that area." Holdsworth told the Hull FC website: "It's a big move to a bigger club and a prestigious club like Hull FC, but I'm looking forward to it and it's very exciting. "Hull FC are pretty much always in the eight and they play finals footy and that is what I want as a professional." Meanwhile, coach Gentle has signed a new one-year extension that will see him stay at the KC Stadium until 2015. He joined from NRL side West Tigers last September and guided the Black and Whites to sixth place this season.